Back in February, a new Harvard study found that "when the entire life-cycle of coal is considered -- extraction, transport, processing, and combustion," they add up to a cost to the American people of "roughly US$300 to US$500 billion dollars annually." Then, in April, we wrote about our interview with Professor Michael Hendryx of West Virginia University, whose research has found that coal mining "is a loser economically, environmentally, and in terms of public health." Now we've got yet another economic analysis coming to the same conclusions. EIA: "Renewable energy shows strongest growth in global electric generating capacity"
For more information on this graphic, see The Solar Foundation's press release ("National Solar Jobs Census 2011 Finds Solar Companies Hiring Faster Than Rest of Economy"). 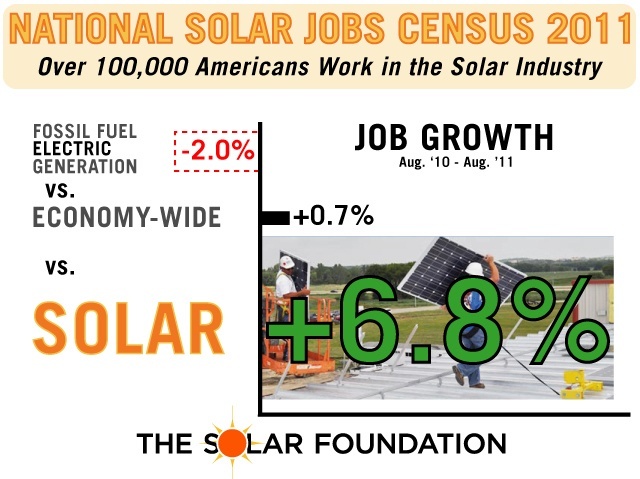 Also note that between August 2010 and August 2011, while jobs in the U.S. solar sector expanded at a rapid, 6.8% rate, "jobs in the overall economy grew by a mere 0.7 percent, while fossil fuel electric generation lost 2 percent of its workforce." No wonder why the fossil fuel industry sees solar as a threat! As this article illustrates, the worldwide consensus is growing that fossil fuel subsidies need to go, and that a price on carbon pollution would be an effective way to combat climate change while also accelerating the transition to a clean energy economy. With all the hot air being spewed around these days regarding the Solyndra situation by anti-clean-energy politicians, you've just got to love stories like this. Much of the media coverage and political commentary surrounding the Solyndra bankruptcy story would have us believe that this wasn't a specific set of circumstances impacting one specific firm, but that it somehow implies broad problems in the U.S. solar industry. In reality, as Stephen Lacey of Climate Progress explains, nothing could be further from the truth.